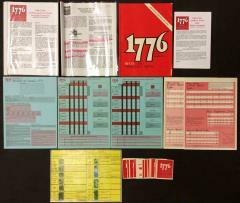 1776 Collection - Base Game + 2 Extensions! Genre: War Game - 1500 to 1800 A.D.
1776, like all Avalon Hill games, is more than just the standard roll the dice and move game. It is a realistic simulation of the strategic situation faced by British and American alike in that fiery decade when the United States won its independence. Actually, 1776 is six games in one: a basic game that gets you quickly and easily into the routine of simulation gaming; an advanced game with scenarios that provide additional complexity and realism; and a campaign simulation game that encompasses the entire war and balances successes in one region against failures in another - truly the ultimate in a simulation gaming experience! Also, if you don't have the time for a complete campaign game, there are four scenarios to choose from; each of which poses a challenge for everyone; from the most erudite of military historians to the fellow who just managed to pass American History. This particular copy also includes two expansions from Counter-Moves: Elite Unites, Artillery and Naval Rules and Command Pressures for Leaders. These are comingled with the original game and are stored in the base game box.